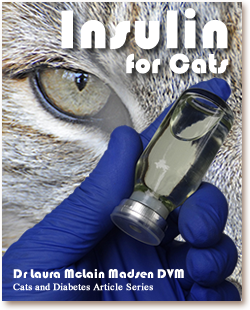 Most diabetic cats will require insulin therapy as part of their treatment. Diet is also an important cornerstone of treatment for feline diabetes mellitus, and a few diabetic cats can be managed with diet alone, but the majority will require insulin. There are a variety of types of insulin available. Some are designed for human use but can be useful in pets, while others have been developed specifically for animal use. The natural insulins produced by cat and dog pancreatic cells have slightly different structures than the natural insulin produced by human pancreatic cells. Insulin types made for human use match the natural human insulin, and may not always be as effective in pets. With any insulin, the goal of treatment is to safely reduce or eliminate the symptoms of diabetes (weight loss with excessive thirst, urination and appetite). There is no ‘best’ insulin for all cats, but some are preferable to others. Many veterinary internal medicine specialists recommend glargine (Lantus®, made by Sanofi Aventis) as a first-line choice. Lantus® is a recombinant human insulin which is usually very effective in cats. In combination with an appropriate diet (canned cat food with less than 7% carbohydrates), glargine has the best chance of inducing a remission, meaning that the cat will no longer require insulin. 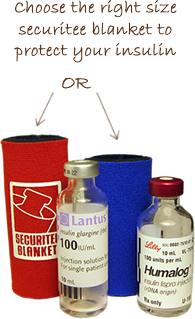 Lantus® is typically dosed at 1 or 2 units twice daily (BID). In some cats it can be used once daily. Once daily administration is not as likely to induce remission—and won’t control the blood sugar very tightly—but is an option for families or cats who can’t do twice daily injections. The glargine product information for human use recommends replacing the vial every 28 days, but if kept refrigerated, the insulin is effective for cats for at least three months. Lantus® is relatively expensive, but the benefits to the cat are significant because of its high efficacy and the possibility of inducing remission. Since such a small amount is administered, one vial generally goes a long way. NPH (neutral protamine Hagedorn) isophane insulin (Humulin N® [Eli Lilly] or Novolin N® [Novo Nordisk]). NPH is a human insulin that is useful in cats. It is not as likely to induce a remission as glargine, but is less expensive, so is a reasonable option when finances are limited. PZI (protamine zinc insulin). PZI VET® (manufactured by IDEXX) was a pork/beef insulin marketed for cat use, but it was removed from the market. Various compounding pharmacies continue to manufacture it, but the efficacy can’t be assured when different formulas are used in compounding, so veterinary endocrinologists do not recommend its use. ProZinc®, manufactured by Boehringer Ingelheim, is a recombinant human PZI insulin that is marketed specifically for cats. ProZinc® is generally safe and effective in cats. Vetsulin® (United States)/ Caninsulin® (Australia, Europe and Canada). Vetsulin® and Caninsulin®, manufactured by Intervet/Schering-Plough, are the same product but are marketed under different names. They contain pork insulin, specifically marketed for pet use, and are useful for diabetic cats and dogs. Vetsulin® and Caninsulin® have been difficult for American and Canadian veterinarians to acquire recently, and so many veterinarians are transitioning away from using them. Caninsulin® may still be available in Australia and Europe. Detemir (Levemir®, by Novo Nordisk) is a human recombinant insulin that is similar to glargine in its action. Preliminary research has shown it to be effective in cats, and in some cases it can be used only once daily. It is important not to change or discontinue your cat’s insulin without specific instructions from your veterinarian. It is also important to use the correct syringe type for the specific insulin brand. Usually human insulins are ‘U-100’ (meaning there are 100 units per milliliter) while veterinary insulins are ‘U-40’ (40 units per milliliter). (ProZinc, although a human insulin, is marketed for pets, and as such is U-40.) There are separate syringes manufactured for U-100 and U-40. If the wrong syringe type is used the cat can be dangerously over- or under-dosed. Generally U-100 syringes have an orange cap and U-40 syringes have a red cap. Injections may be scary when you first learn to give them, but you and your kitty will quickly get into a routine. The needle and syringe used are very small and the discomfort from the injection is minimal. Regardless of the insulin type used, the injections will need to be given at the same time every day. Most insulins need to be given twice daily—as close to every 12 hours as possible. Most veterinarians recommend feeding the cat twice daily, immediately before the insulin injections. It is important to feed before insulin, because if the insulin is administered first but the cat refuses to eat, he may become hypoglycemic. Diabetes in cats can often be transient. After a period of treatment with diet and insulin injections, the cat’s pancreas cells can regain their ability to secrete insulin. This is most likely to happen within the first few months of starting treatment, although it can happen even years after diagnosis. Lantus® is the insulin type most likely to cause remission, but it can be seen with any insulin, so it is important to watch closely for symptoms of hypoglycemia (sleepiness, lethargy, weakness, seizures). If you suspect your cat may be hypoglycemic, check his blood sugar at home if you have a glucometer, or administer oral corn syrup or honey (rub on his gums) and take him to your veterinarian as soon as possible. Remember that every cat is an individual. If a cat isn’t doing well on a particular brand of insulin, an alternative type may be necessary. Your veterinarian will also want to make sure there isn’t a concurrent illness that may be causing insulin resistance, such as dental disease or urinary tract infection.